Palmwag Lodge is in a lovely setting, surrounded by plam trees near the Uniab River in a private concession. 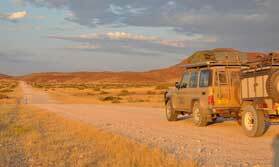 Fill your days with game drives and guided walks and, if booked in advance, tracking rhinos. Nature in the form of landscapes and wildlife, is at the heart of your stay. There is single, twin and family accommodation, made up of rooms and tents. Beds are fitted with mosquito nets, there are shelves for storage, and all have an en-suite bathroom. You can take morning and afternoon game drives, the latter including sundowner drinks, and full day safaris to explore further reaches of the concession, Wildlife includes zebra, giraffe, kudu, springbok, ostrich, desert-adapted elephant and black rhino. You can also take walks with a guide near the lodge, and spend a night camping out under the stars on the Under Canvas programme. Tracking rhinos is a rare privilege and needs to be booked in advance. Relax between activities as you sit and chat to fellow guests at the bar, enjoy some sunbathing and take a swim in the pool. The lodge has a restaurant plus a pool bar which offers snacks and drinks. Open: Palmwag Lodge is open all year. Location: The lodge is on the Uniab River in a private concession in Kunene, formerly called Damaraland. The lodge has an airstrip. Rooms: There are single, twin and family rooms, all en-suite. There is a campsite, too. Activities: You can go hiking with a guide, take half and full day game drives, enjoy bush picnics and sundowners, and camp out under the stars. You have the chance to accompany a guide and tracker on a rhino tracking excursion, which must be booked in advance. Facilities: These include a swimming pool, a pool bar, sitting areas and a restaurant. Dining: The restaurant has indoor and outdoor dining areas and provides breakfast, lunch and dinner. The pool bar serves snacks and drinks. Children: Children of all ages are welcome. The minimum age for guided walks, rhino tracking, and the camping sleep-out is 12 years. Communication: There is no Wi-Fi internet access.